Riders should be charged $1 each time they board the Metromover instead of relying on taxes meant to fund expansion of the county’s rapid transit system, Miami-Dade Commissioner Sally Heyman told a Transportation and Public Works Committee meeting last week. Ms. Heyman said residents she spoke with are willing to pay a small fee to use the mover, a free piece of the Fixed-Guideway Rapid Transit System that also includes Metrorail. Ms. Heyman’s recommendation came in response to two agenda items related to expanding the Metrorail station in Brickell. Assistant County Attorney Dennis Kerbel confirmed the expansion would increase population density around the station, which would lead to more tax revenue for the City of Miami. That, Ms. Heyman said, is unacceptable when transportation routes in other parts of the county are suffering. “I think it may be time, when you come to us and say we have to cut a route, that you remember a day like today where we’re increasing the value of surrounding land in a city that is not contributing a penny to what our transit system exclusively makes the rest of the community and 12 other districts – or 11-and-a-half other districts – pay without an economic benefit to us,” said Ms. Heyman, who suggested Ms. Bravo prepare a study to determine what other major US cities have optimum rail transit systems while not charging fares in their densest metropolitan areas. “I think you’re not going to be any more surprised than me to find out: none,” she said. 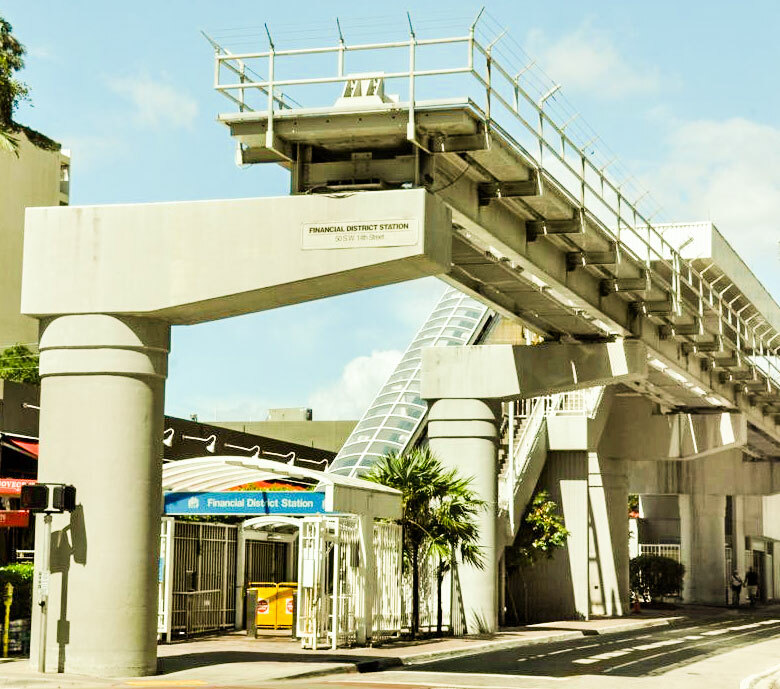 The argument over whether to impose a Metromover fare may be familiar to many county residents. The 4.4-mile automated downtown train loop cost 25 cents per ride until 2002, when voters approved a half-penny sales tax as part of the People’s Transportation Plan (PTP). That tax partially funded free rides on the Metromover, whose daily ridership Ms. Bravo told the committee is about 35,000 – the county’s latest report, for March, shows Metromover averaged 31,100 riders weekdays, 20,700 on Saturdays and 17,900 on Sundays. After voters approved the tax to fund the PTP, the county commission rerouted those funds, which were created primarily to fund county-wide transit expansion, to cover general transit operations and maintenance. The Metromover, however, remains free for all riders. The major argument against reinstating fares is it will cost more to install fare boxes and systems necessary to charge riders, said Commissioner Dennis Moss, who added he was interested in hearing “a fresh perspective” on the idea. Hey, seems like we have a local politician who may finally think like a logical human being. Lower and Middle Class workers in other areas of Miami have to pay $2.25 a trip. Metromover cost a lot money to operate, yet the wealthy, rich people in the Brickell area get unlimited riding on it(Miami Transit) for free, it never made any sense. If those people in the Brickell area can afford Million dollar High Rises, they should definitely pay their fare share to ride on the Transit system. The people you refer to are not the metro mover users. Instead, it’s mostly the people that work in the area and their visitors who are not residents. The mover is also an effort by the city to cut down traffic, paid for by a half penny tax increase. Its so obvious that for commissioner Moss there is never a right particular point and time for him. If there is no piece on the pie $$$ coming to him. How can this commissioner say its going to cost more to install fare stations then to operate the system. The installation will pay for its self in less then a yr.
Once the revenue starts coming in. This COUNTY needs a body of commissioner’s who are not afraid to take risk for a better tomorrow. I’m sorry. Important information left out: How much will it cost to install fare collection equipment? At $1 a ride with current ridership it will never recoup that cost. Yes, start to charge for the Metromover, I’m sure you can get the money to pay and run the equipment. I use it everyday, a lot of tourists also use it to visit different points of the city. What I think you need to create is some kind of pass for international visitors, they will need to present their passport to buy the pass for all the systems. Minimum 3 days, 7 days up to 10 days pass. Why only $1, Why not charge $2.25 like every other Transit Station to make sure you can recoup the Fare Vending Machine cost and cover operation expenses. Riders on the Metromover are decreasing even though is free. They will never recoup the investment needed to make it a pay system. Do you think people will pay $2.25 to go a couple of blocks away? NO!. Because nobody will pay $2.25 to go a couple of blocks away. Even with a free fare ridership is falling. Imaging if they start charging $1.00, or $2.25 per ride; They will never recover the investment needed to make it a pay system. Anyone who thinks the metromover is only used by rich brickell residents has never been on the metromover. It’s too small of a system and not enough riders to collect a fare. Collecting a fare will cost MORE than the amount of money it brings in. Get over it. Metromover is the only thing Miami-Dade County has ever done right. It will keep the bums off though. The bums are people too. Many “bums” have mental, drug problems and need our help. A little bit of sympathy will go a long way. I take the mover infrequently but value the function is has for making our most urban area more functional for all residents most of whom commute downtown from other Commission districts. The previous fare was abandoned because it actually COST money to charge a rider fees as we look toward common sense transit solutions there are most assuredly better options. For everyone who takes the metrorail and the metromover to work daily, this is an awful idea. Especially at $1 each way. thats $2 per day, 5x a week. $40 a month, $480 a year. Not to mention the metrorail costs $120 monthly. Absurd! As someone who lives in the suburbs and needs to commute downtown for work, it would no longer be beneficial to take public transportation. You’d be clogging up the highways even more than they are now. Geez, why not just raise sales taxes to 10%-15% which will generate tons of new revenue to expand our Transit Train System into every corner of Miami Dade and let it be free or at least very cheap, $1 dollar for everyone through out the entire system. I doubt that Ms. Heyman has looked at the other riders that accompany her on the Metromover. The vast majority are not wealthy Brickellistas but are lower and middle income workers who would be pressed to add that additional cost to their commute. If anything, this banana republic of a city should be extending the Metromover, north and south, funded by the developers who are given free reign in this town. Keep it free and extend the Metromover. Being that the metro mover is in downtown, it’s an amenity for the entire city. I’m not against a fee to ride but I’m sure many frequent riders would be. Her argument that people who chose not to ride it or do not live in the area shouldn’t have to pay for it would be like me saying that because I don’t have children I shouldn’t have to pay for education taxes. Doesn’t work. Mr. Moss is correct. It would cost Transit millions to install and maintain a functioning fare collection system that would take decades to break even. We as a County are drowning in traffic. Solutions need to be implemented, not studied repeatedly. It’s time for action. Ridership on the Metromover is falling even though its free. If they start charging $1.00 per trip nobody is going to use it and they will never recover the investment needed to make it a pay system. I agree that installing such system, with gates and turnstiles, plus the electronic system needed to collect, will take much longer than one year, especially because should the fares be implemented, the system will lose riders, such as myself. I refuse to pay 1.00 each way to pay for a 1980 designed system that was never updated, and breaks down or has delays in one form or another every day, and it was never expanded, so it covers a very small area. I’ll switch to the free trolley if that’s the case. Modernize, start using the same trains and systems of the new trains being used at the airport, expand to Miami Beach, then I’ll gladly pay. The hell do you expect to have better TRANSIT! We can charge $2.25 for the metro mover if we take it and expand it from Brickell station south up 8th st all the way to FIU. It can generate over $638 million dollars in 30yrs. This will be perfect when the famous Calle Ocho festival is in town to transport 1000s’ of tourists. This expansion will also get millions of citizens and students to travel to FIU. Then I can say we’re making transit great again just like NYC MTA. Why would taking public transit be a better option than driving if its going to be $4.50 daily? plus the Metrorail, which is over $100 monthly? You’d push everyone back to driving and you’d put way more homeless people on the streets when the majority of the time the mover offers a service to them that nothing else can provide. Awful idea.